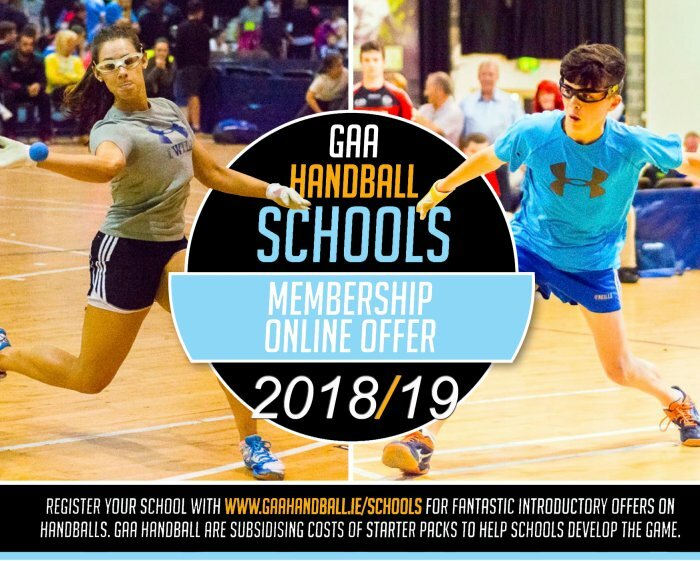 After the continued success of last years Schools Membership Scheme, GAA Handball are again delighted to release the 2018/19 Schools Membership Scheme, which again enables Schools nationwide to purchase Handballs at their lowest ever price as a special introductory offer. In it's introductory year last year, 1000's of Handballs & promotional items made their way to hundred's of schools, both Primary & Secondary, across Ireland, as our great game found it's way to new areas of the country, and with it introducing our game to a vast new network of players. Over the last number of years, GAA Handball’s One-Wall for Schools Initiative has seen huge growth, with an ever-increasing number of schools not only taking up Handball for the first time, but also proceeding to actually build Handball specific walls. Now with 400+ schools building One-Wall courts in their sports halls and outdoor areas in recent years, this membership scheme provides schools with an excellent opportunity to further develop the game of Handball in their schools. GAA Handball’s National Development Officer Darragh Daly is excited about the third year of the membership scheme, and hopes it will essentially get more children playing Handball around the country. “We were very happy with the interest in our Membership Scheme, but we want to push on for this coming school year and increase our numbers further. I hope everyone in the Handball community will pull together and help spread the word with their local schools and make the 2017/18 Scheme bigger and better." "This year we have included a new option to purchase the specialise Challenger 1 Beginner Balls, specifically to suit the needs of the younger children and Primary Schools. This ball is softer and less bouncy and I personally believe it is a brilliant ball to get children started playing Handball." On top of the Handballs, a vast array of new promotional items and coaching resources are included in the membership packs, whilst every school that registers will also be included in monthly draws for prizes and coaching sessions with some of the games top players. 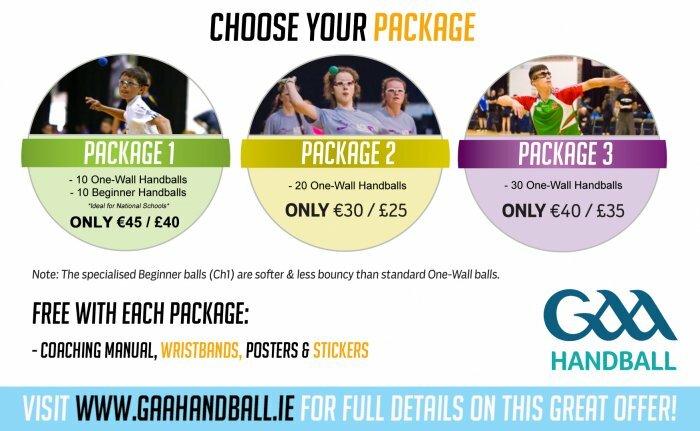 Schools can simply register with GAA Handball at the below online link and select which package they want. Not forgetting teachers, particularly student teachers, who are more than welcome to register for a pack in order to develop Handball during their placements, etc. The registration only takes a few minutes, and payments can be made via card or cheque to make the process as user friendly as possible. See below for the package contents and link to registration. For additional information/queries, please contact National Development Officer Darragh Daly on development.handball@gaa.ie.